Rick from Cornwall has his BSA Otter for sale these are a bit like the Hens Teeth so grab it if you are interested. Both of the attached machines have come from a deceased's estate so I know nothing at all about them apart from what I have gleaned from the internet. 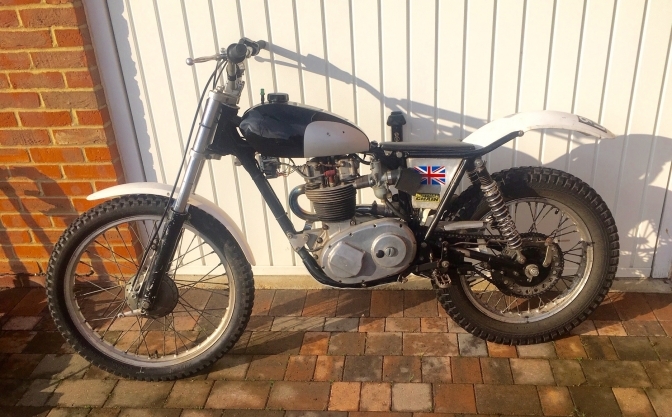 The red one is undoubtedly the David Shave machine as it still has the sticker on it as featured on your website, the black one looks to be a de-lugged standard B40 frame with a SM alloy tank (loose at present) I'd appreciate any thoughts on that one as to other parts fitted or its origin. Both bikes have B40GB engines. The auction is to be held on 22nd April at Cheffins Auctioneers, The Sale Ground, Sutton, Ely, Cambridgeshire CB6 2QT. 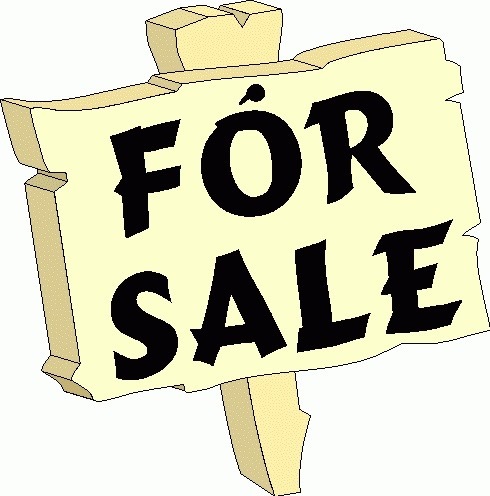 Viewing is 1pm onwards on Friday 21st April and from 7:30am on sale day. 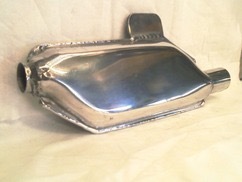 The catalogue will be available two weeks prior to the sale date on www.cheffins.co.uk under the Vintage section or £17 by post. There is no charge for entry to the sale, over 50 motorcycles, loads of spares and every vehicle from bicycles to full size steam engines together with everything related. Around 2,500 lots in total. I can be contacted on this email address or by phone 01353 777767 (option 2) or 07775 866166. Many thanks for your interest and hopefully hear from you soon. 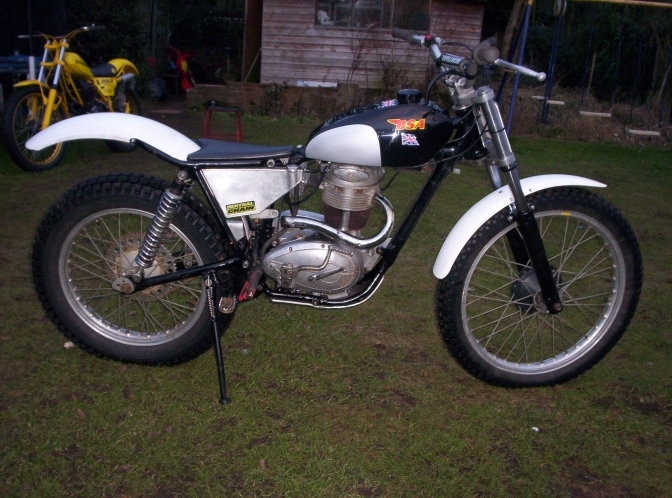 This is the ex David Shave "Sammy Miller BSA Otter" that Dave rode in the 2013 Scottish two day trial. anther BSA Otter that slipped through the net. So if you buy this one you should be good for a Scottish ride next year? 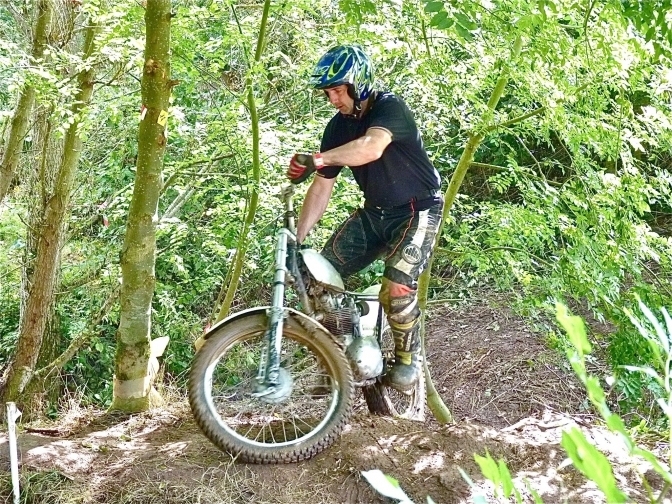 Dave finished the 2013 trial in 25th place and won a First Class Award, loosing 20 marks. You can see how well this machine as been put together by Dave and kept in that condition by its late owner. 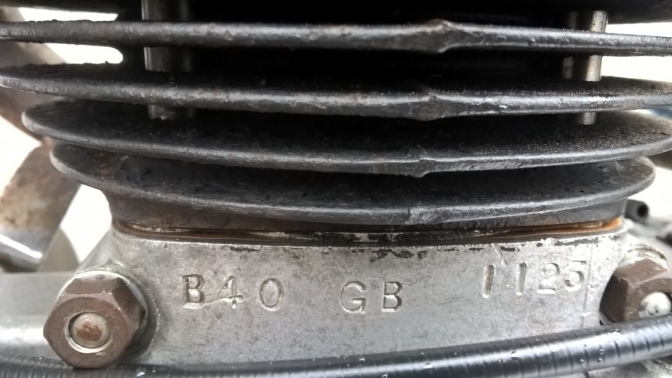 Rockshock rear units are about as good as they come, and you all know that the WD BSA B40 engines are the ones to own with the right gears fitted and sorted by Pat Slinn all those years ago. The frame is one of the Last "Otter" frames that Sammy had built for him after the split with Faber frames. 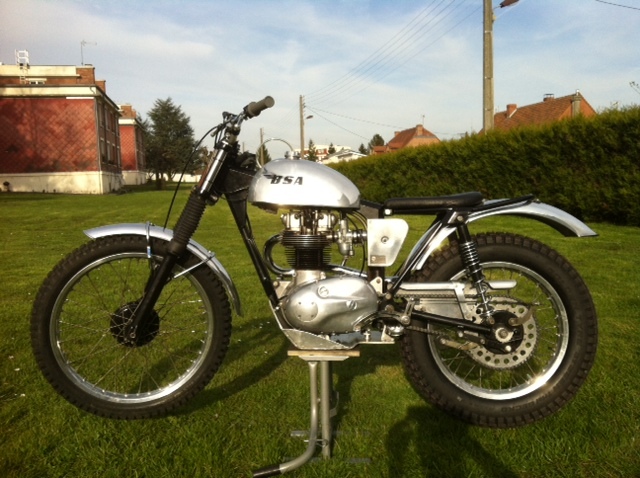 Sam went back to the original concept by having a bolt on Triumph type rear subframe. Hubs look like they are the Alan Whitton alloy replicas to me but you will have to check that out for your self. 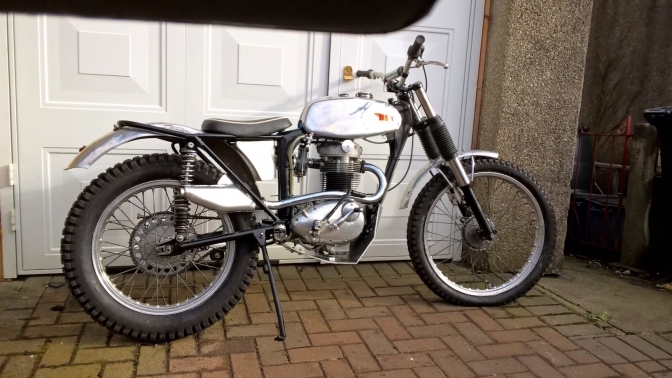 Front forks are the BSA/Triumph four stud type the ones I use on all of my builds, How Dave got away with using them in the Scottish trial though I don't know. The silencer and air box are made by our old friend Terry Weedy from Avery products. and this was when Sam was still getting them from Terry. What more can I say if you wont a bike of your dreams you will have to go and bid on it wont you. Here is the proof that the bike was ridden in the Scottish trial, and as I say another "Otter" that slipped through the net. 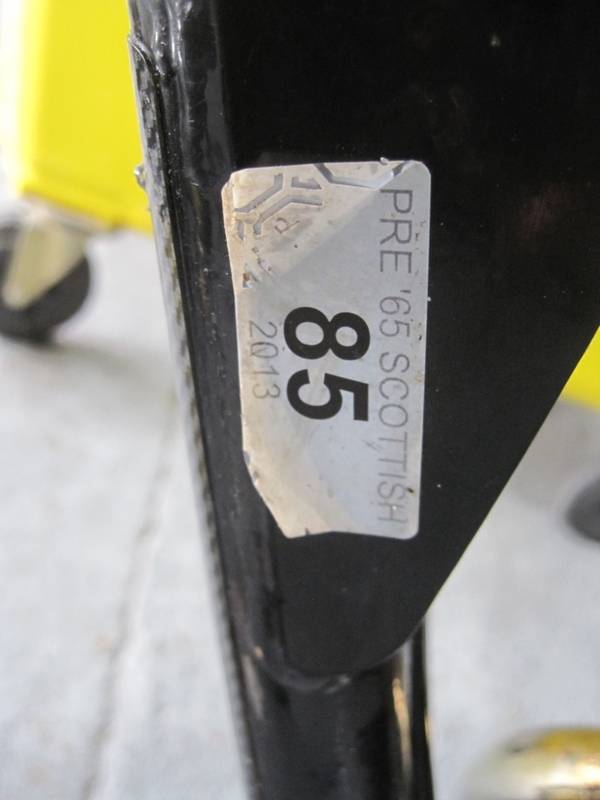 But we know that this happens every year, and with the sticker for proof you get a Pre 65 Scottish compliant machine if you can get an entry. £40 + Post and packing. 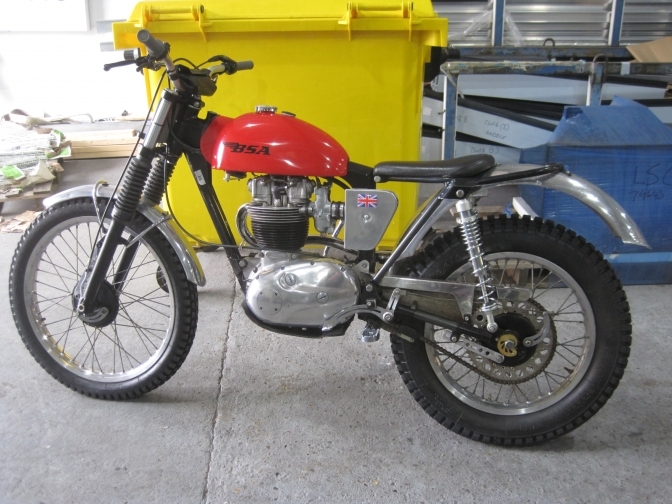 The second BSA B40 WD. 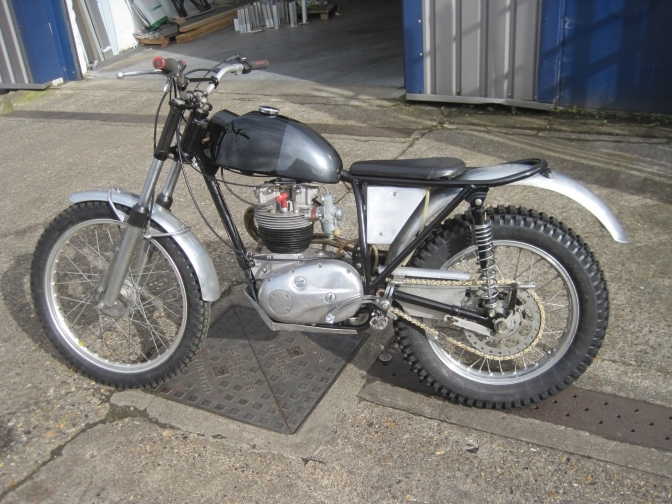 This second BSA B40 WD has most of the right bits. Firstly the engine, and you know that these now make £1000 in any condition. and this motor looks tidy. The frame has all the unnecessary frame lugs removed and the seat tubes pulled in the first trick the works boys did with these frames. The Leading axle front forks look like they may be Royal Enfield or even Kawasaki, but you will have to make your own mind up. Front hub looks like a Honda 90? 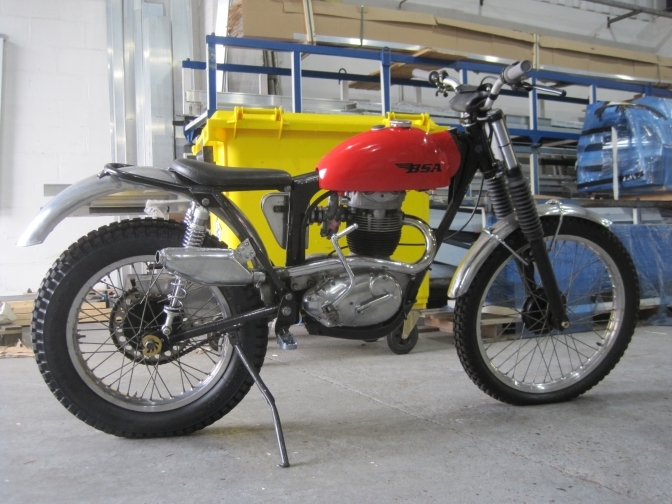 or may be Montesa? There is a spattering of Sammy Miller Products parts, IE, seat and rear brake pedal.and probably footrests and chain tensioner, and the rests look to be in the right position. and don't forget the New rear chain. And a well constructed large alloy oil-tank. Seems to me the bike was a week away from being finished, and one you would not have to spend a lot more money on to jump on and ride. May be more Machines Later. Another BSA Otter for sale. This one is a Sammy Miller framed bike. and Lives in France. here are some photos of the bike and the owners contact Number. Sammy Miller aluminum parts: tank, air filter housing, front and rear mudguards, AR brake pedal, chain guard, front GB arches. BSA B40 GB WD Engine. Hughie Irving has his Foster B40 Otter for sale. Have just completed rebuilding this bike Total engine rebuild all bearings shims seals, new valves, and stems, footpegs lowered, New chain guard, alloy air box ,good tyres,new bars, amal levers, owing to knee replacement too heavy going back to cub. Must be worth £3750 originally came from Cornwall. The complete frame has been recently powder coated. And you can see a new exhaust system as been fitted. And New Electrex-World ignition fitted. 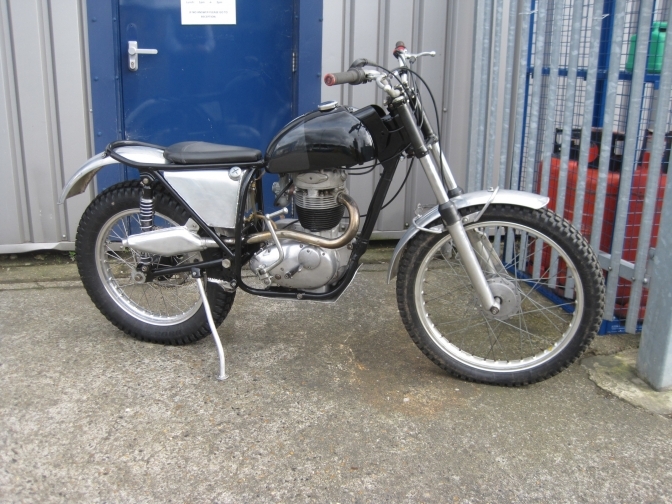 It now is a very tidy bike and you know Foster Otters are collectors items, now as well as being very ridable machines. You can mail me char7748@tiscali.co.uk or Hughie. "the.irvings11@gmail.com" if you are interested in the machine. Foster BSA Otter, B40GB engine. Foster BSA Otter BSA B40 GB engine. 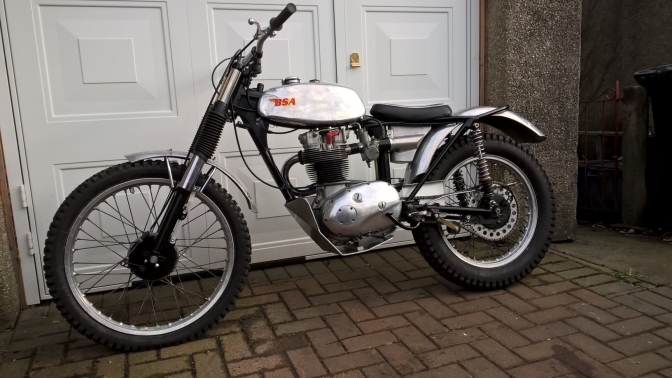 BSA B40 350 GB ex WD engine. There are two more "Otters" for sale here. This is Dave Wood riding the winning BSA at the 2010 Classic trials show. 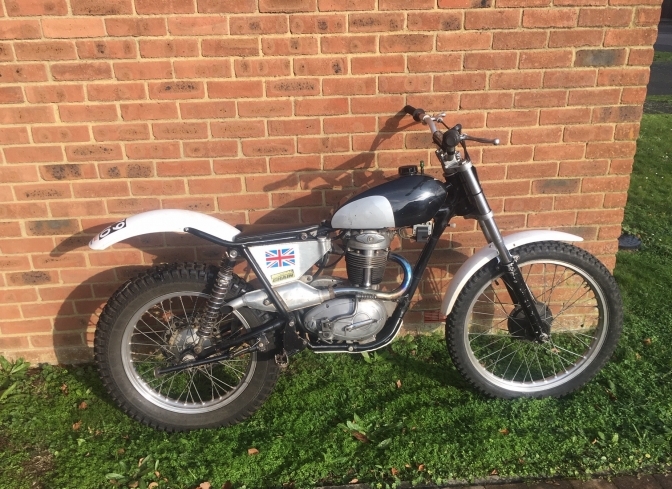 So If you are looking for a piece of Classic trials riding history and or a machine that will perform just as well today as when Dave owned it. Act quickly as the machine wont be for sale long. Someone with an eye for a good if not great little machine will snap it up quickly. Byron is open to sensible offers for the machine that resides in the county of Kent at the moment. his phone number is 07940467147.......Give him a call.